There is something for everyone at santa day! Your child will love visiting Santa, getting their face painted, writing a letter to Santa, enjoying a pony ride, and more. 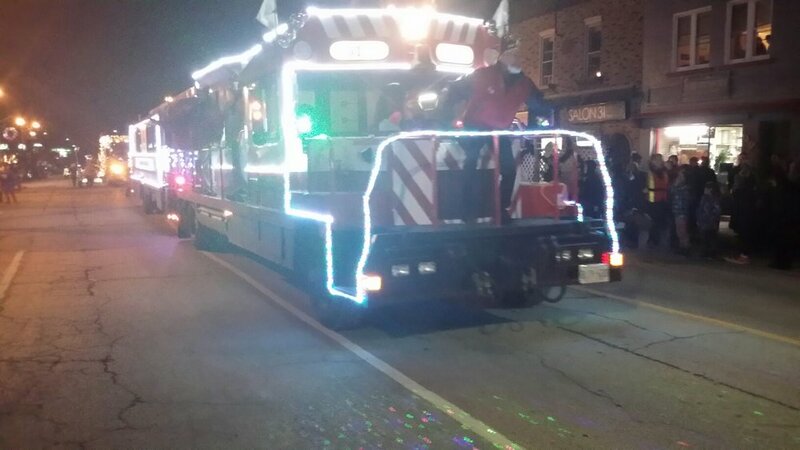 Experience the magic of the Santa Day parade. 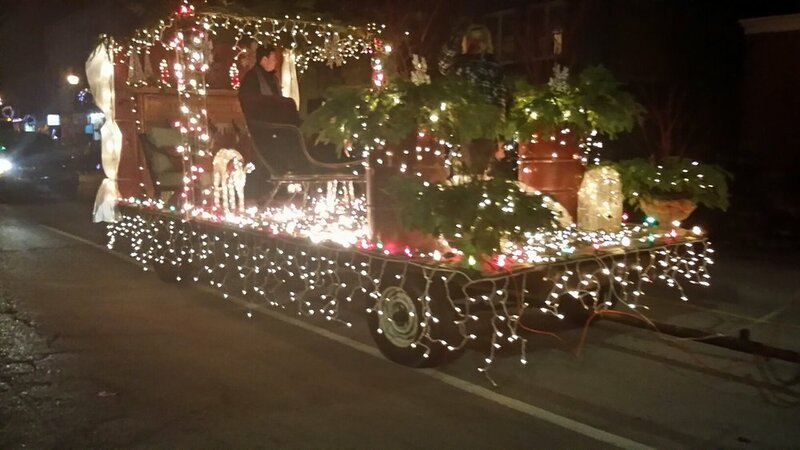 3 professional bands, dozens of illuminated floats, and lots of characters! 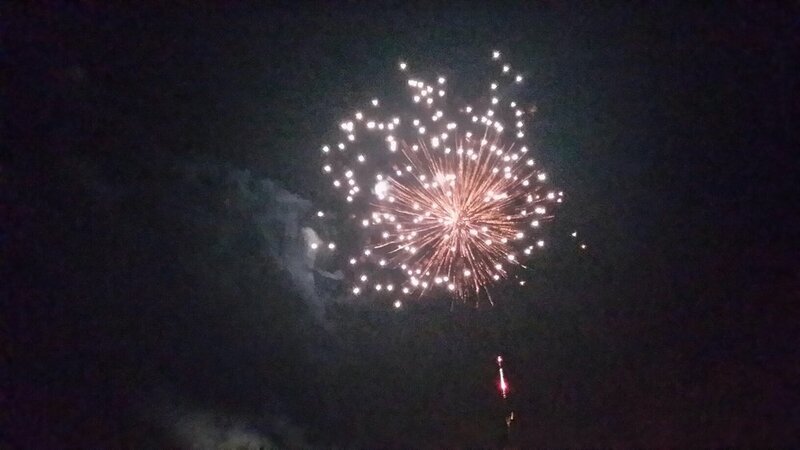 This firework display is the final celebration of Santa Day. Watch the sky light up over the falls after the parade. … and so very much more. There is just enough time to fit it all in. So much FUN, all for FREE! Stop by Santa’s House at Stewart Morrison Insurance Office – 47 Colborne St. Santa is in his House starting at 11 am. Everyone loves a free photo with Santa! He will give a free gift to show you how much he enjoyed your visit. Please note: Santa’s house shuts down at 3:45 pm so he can get ready for the parade. Visit the Petting Zoo at Bert’s Appliances – 54 Colborne St. This popular attraction is back with all the farm animals for you to visit with. If it rains, they’re all tent covered – and so are you. Mom and Dad will love the hand sanitizer too! Enjoy a Pony Ride at The Corral – 12 Francis St. Ponies are a great treat for all the children to ride. Decorate your very own gingerbread cookie at Slices & Scoops while viewing the Gingerbread House entries. Click here to learn more. Participate in Gingerbread Contest & Cookie Decorating at Slices ‘n Scoops – 10 Water St. Click here to learn more. Experience the Hand Bell Choir at Slices ‘n Scoops – 10 Water St. Enjoy the beautiful harmonious sounds of the hand bell choir. Let them infuse you with the Christmas spirit. 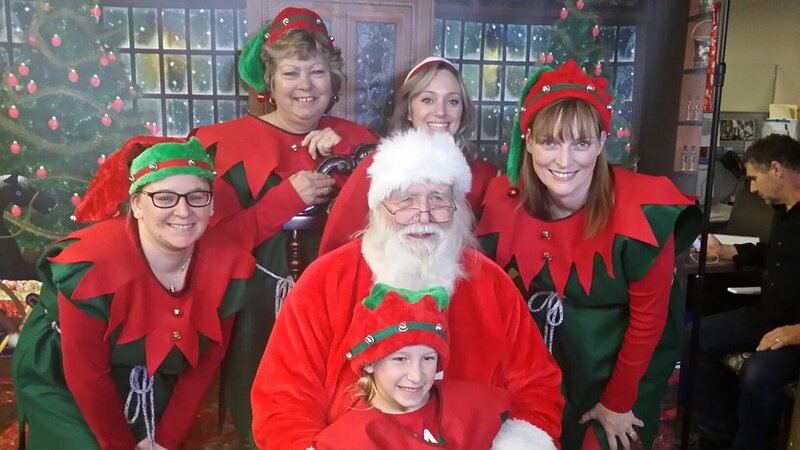 Santa’s face-painting elves are at the two locations in the Village, Salon 31 at 31 Colborne St & Trish’s Hair Design at the Barn & Bunkie Bunk House at 14 Oak St. They are eager to add colourful flowers and holiday graphics to decorate your face. Write Letters to Santa at The Fenelon Falls Library – 19 Market St. The Library has all you need to write your letter to Santa! Enjoy Christmas Crafts, Activities & Roasted Chestnuts at The Fenelon Falls Museum – 50 Oak St.
Watch Chainsaw Carving outside at The Lil’ Wee Quilt Shoppe. Watch our carver transform a piece of wood into almost anything – with only a chainsaw. He is a professional carver. Just follow the noise….he loves visitors. 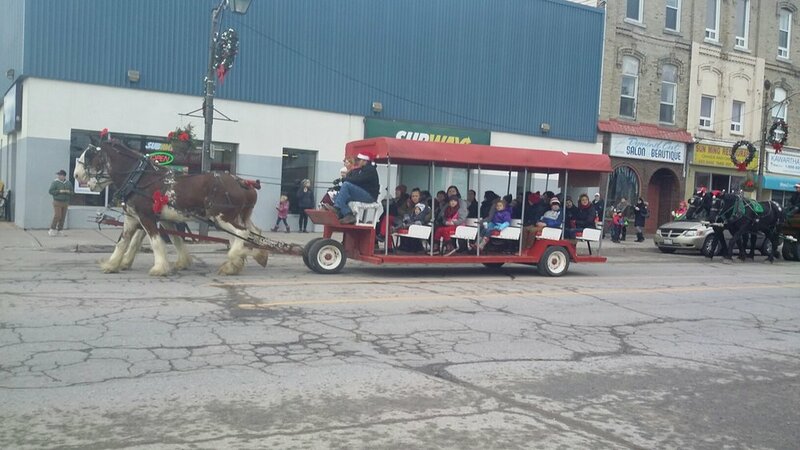 Hop on a Wagon Ride – pick up / drop off at May St. parking lot. Hop aboard one of 5 hay wagons to get around town. It’s a favourite way to see all that’s going on. Just watch for designated stops and hop off at your next adventure! Pet a Bunny at Royal LePage – 47 Colborne St. Beautiful, soft and friendly bunnies await the loving touch of the little ones. Various species of rabbits are there to be picked up and stroked. Get your camera ready! Make Icicle Ornaments at The Book Lady on Market St. Create Magic Reindeer Food at curious? – 10 Water St.
Make Kids Christmas Ornaments at Between 2 Lakes – Water St.
Hip hip hooray, the reindeer are back! Visit these incredible creatures at the Blue Oak Gallery. Hair Extensions for ages 12 & under only Visions Hair/Bliss Beauty Bar Francis St. W.
Temporary Tattoos for Kids at Kings Ink Tattoos at 18 Francis St. E.
Experience J’s Magic – Jason will be wandering Colborne St. with his lively and fun magic show which is highly entertaining for the whole family. Headquarters and Lost & Found located at Mike & Jocelyne Barkwell’s on Colborne St. beside the Lil’ Wee Quilt Shoppe. Drop off a Food Donation to The Lighthouse Restaurant on Colborne St.
Keep an eye out for our Town Crier wandering around downtown Fenelon Falls. Santa Day Headquarters and Lost and Found - Mike & Jocelyne Barkwell -10 Colborne St. beside The Lil’ Wee Quilt Shoppe. 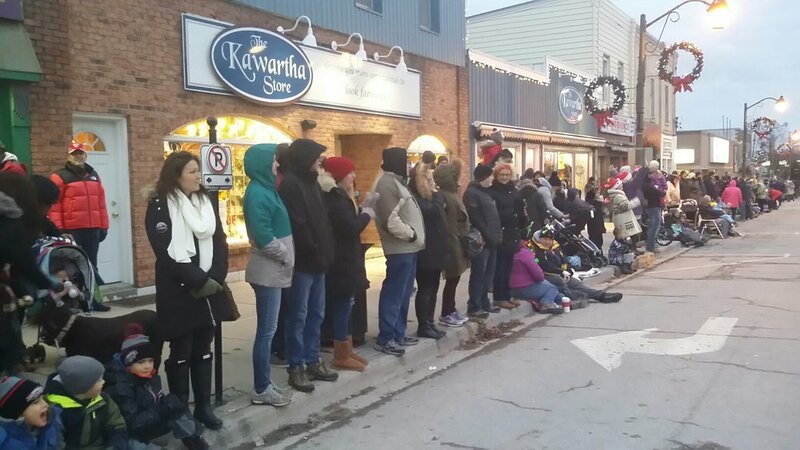 Hot Cider at Bert’s Appliances – 54 Colborne St.
Candy Cane Hot Chocolate & Kids Sparkle Tattoos at Silhouette Beauty + Medi Spa – 48-H Colborne St.
Bring Your Mug for a Free Tim Horton’s Coffee at Country Cupboard - 9 May St. Deep Fried Cookie Dough at On The Locks – 12 Water St.
Baby Feeding & Changing Area at Fenelon Cleaners & Solar Laundry – 16 Market St. Hot Chocolate & Cold Drinks at Kawartha Lakes Winery – 6 Water St.
Cider & Cookies at Sweet Bottoms Coffee – 19 Colborne St.
Apple Cider and Christmas Cookies at The Kawartha Store – 30 Colborne St.
Tree Seedling Giveaway, Apple Cider & Popcorn with A Wee Tree Farm and Barn & Bunkie at Barn & Bunkie Bunk House on Oak St. behind Murphy’s. Hot Chocolate at Re/Max All-Stars Realty Inc. Brokerage – 51 Colborne St. Hot Apple Cider at Diana’s Gifts - May St. Hot Chocolate at Headquarters - Mike & Jocelyne Barkwell - 10 Colborne St. Hot Soup at Farmer’s Market - old arena parking lot on Bond St.
Finger Pancakes & Hot Chocolate at Enbridge Gas Distribution Inc. next door to Subway. Hot Chocolate & Shortbread at Kawartha Shortbread from 3 pm to 6 pm – 77 Lindsay St. Hot Chocolate & Kids Cookies at Dolce Custom Cakes & Pastries from 11 am to 2 pm – 18 Lindsay St. Hot Dogs (one per person) at The Cow & Sow from 3 pm to 5 pm – 38 Colborne St. 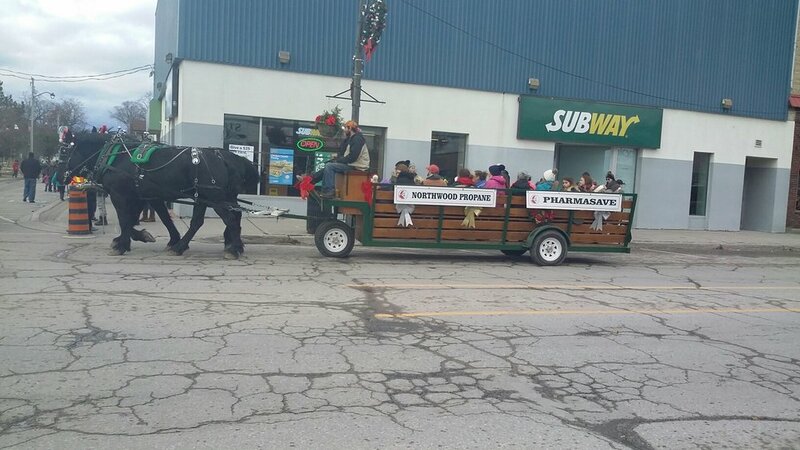 Hot Chocolate (while waiting for the parade) at BMO from 4 pm to 5 pm – 39 Colborne St.
Meet Saint Nicholas at St. James Anglican Church from noon to 4 pm – 19 Bond St E.
Kid’s Candy Bags at Grr8 Finds from noon to 3 pm - 27 Colborne St. Hot Chocolate & Cookies from 3 pm to 5 pm at The Little Pie Shack - 6 Francis St. E.
Refreshments and Tour of Lodge at Spry Lodge #406 from 10 am to 2 pm - 10 Green St. behind the high school. Personalized Kid’s Pizzas ($) at Godfathers Pizza from 11 am to 2 pm – 116 Lindsay St.
Hamburgs, Hot Dogs, Sausages & Baked Goods ($) by Fenelon Falls Secondary School Spirit of Christmas at Bert’s Appliances from 11 am to 5 pm - 54 Colborne St.
Breakfast with Santa for Food Bank (donation) at the Fenelon Falls Seniors Citizens Club from 9 am to 11 am – 58 Murray St.
Dessert Cafe (donation) at Trentside Baptist Church from 1 pm to 5 pm – 80 Colborne St.
Free treats for the kids & winter hats for sale at Fenelon Brewing Co. Proceeds are going to the Community Foundation of Kawartha Lakes. 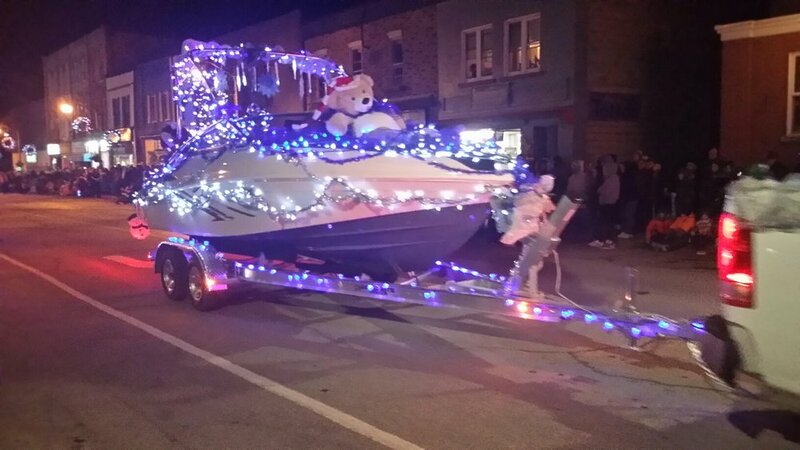 The night time parade and firework display are the cherry on top of the delicious cake that is Santa Day in Fenelon Falls. 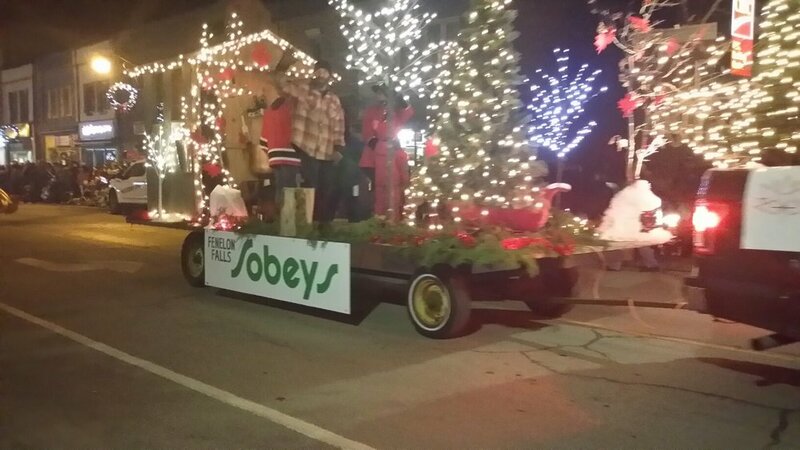 The parade starts at 5:00 PM at West & Lindsay St. (by Home Hardware) and crosses over the falls, continuing up Colborne St., ending at the ball diamonds. Almost 2 km of sidewalk space (on either side of the street!) is available for frontline seats. Come a wee bit early to snag the perfect spot for you and your family to enjoy all the illuminated entertainment. 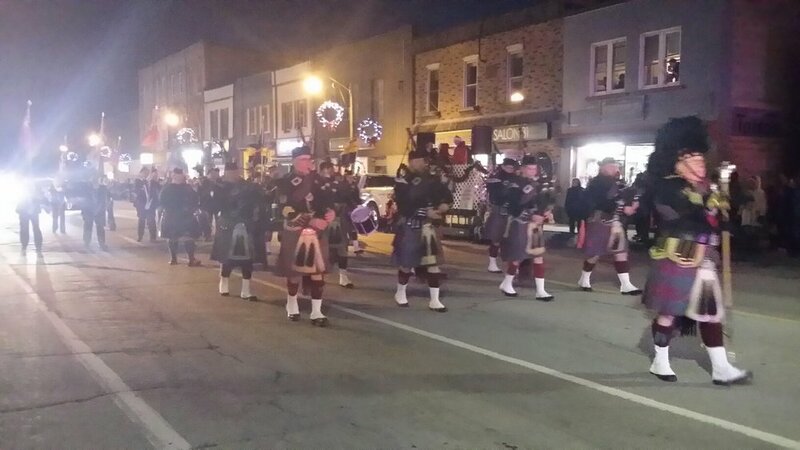 This Parade involves local businesses, volunteers and professional marching bands. 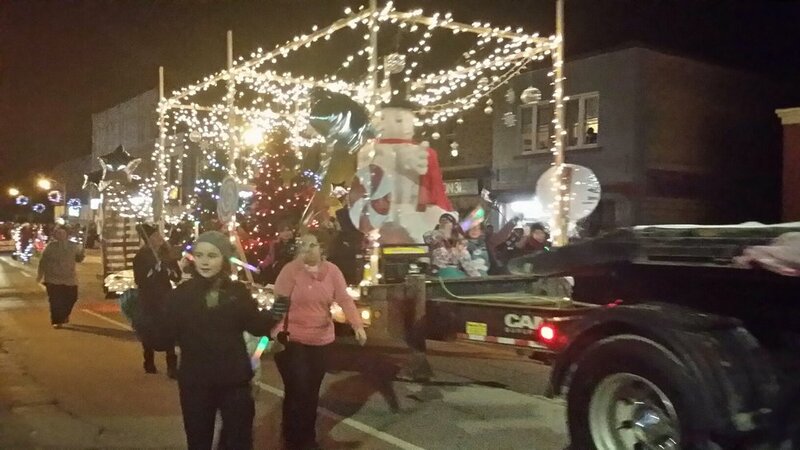 The creative and amazing floats, dancers and music makers, along with tons of Santa Day extras, make the night time parade at Fenelon Falls’ Santa Day sure to gather everyone together. 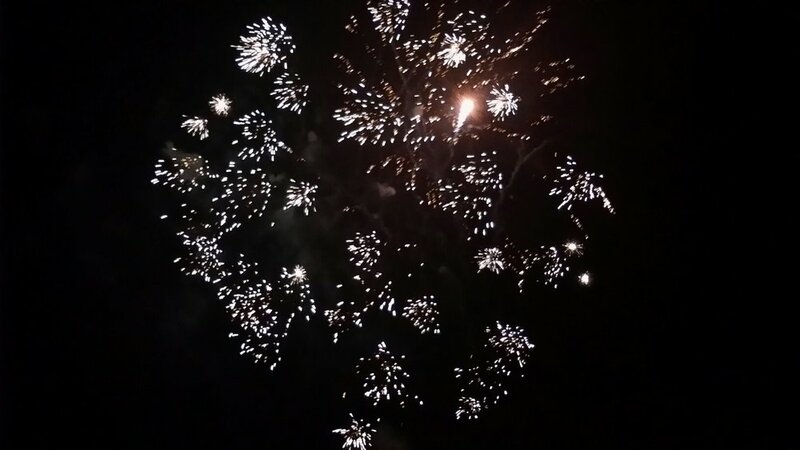 Immediately after Santa crosses the bridge and moves up the street you will see the most amazing fireworks light up the sky over the gorge down by the falls.